Welcome to Vegas. New Vegas. It's the kind of town where you dig your own grave prior to being shot in the head and left for dead...and that's before things really get ugly. It's a town of dreamers and desperados being torn apart by warring factions vying for complete control of this desert oasis. It's a place where the right kind of person with the right kind of weaponry can really make a name for themselves, and make more than an enemy or two along the way. As you battle your way across the heat-blasted Mojave Wasteland, the colossal Hoover Dam, and the neon drenched Vegas Strip, you'll be introduced to a colorful cast of characters, power-hungry factions, special weapons, mutated creatures and much more. Choose sides in the upcoming war or declare "winner takes all" and crown yourself the King of New Vegas in this follow-up to the 2008 videogame of the year, Fallout 3. Enjoy your stay. Features: Feel the Heat in New Vegas--Not even nuclear fallout could slow the hustle of Sin City. Explore the vast expanses of the desert wastelands - from the small towns dotting the Mojave Wasteland to the bright lights of the New Vegas strip. 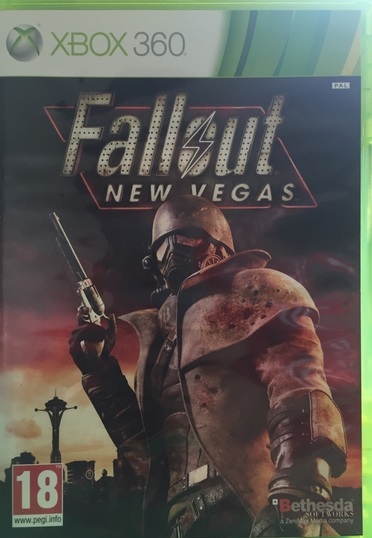 Feuding Factions, Colorful Characters and a Host of Hostiles--A war is brewing between rival factions with consequences that will change the lives of all the inhabitants of New Vegas. New Systems--Enjoy new additions to Fallout: Special melee combat moves have been added to bring new meaning to the phrase "up close and personal". An Arsenal of Shiny New Guns--With double the amount of weapons found in Fallout 3, you'll have more than enough new and exciting ways to deal with the threats of the wasteland and the locals. Let it Ride--In a huge, open world with unlimited options you can see the sights, choose sides, or go it alone. Peacemaker or Hard Case, House Rules, or the Wild Card - it's all in how you play the game.